…Or, how to reframe and get neutral in highly charged emotional situations. In fact, Conversational Intelligence is a three skills when you thinking you’re learning one…kind of book. 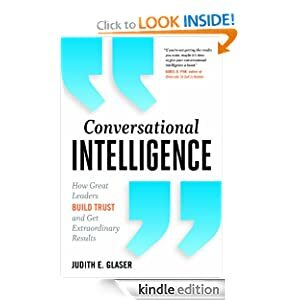 Judith E. Glaser, a frequent blogger here, wrote the book so leaders can become better communicators. After all, great communicators can rally the troops and make change and innovation happen or turn around a business’ performance. What’s wonderful about the book is all the information she teaches about how our brains are wired to protect us and help us survive. Our brains can also trick us into thinking we’re threatened or that we’re right and, if we act on that too rashly, the consequences can be bad. Add the pressure of more responsibility, less time and you can see what happens when shortcuts are taken in communication and relationships. We can steamroll and force our worldview. On the other hand, we can flee or avoid, especially if we feel someone is a danger to our career or whatever we hold dear. Her explanation of how the brain works provides a great framework for understanding these motivations. We can destroy relationships with an outburst or we an exclude people because we imagine a betrayal. But, what I found most intriguing and helpful are her recommendations on how to elevate through questioning, understanding and other means to empathize and rebuild trust, the foundation of any great relationship. You can imagine using this technique in a heated negotiation or when you feel slighted. I know you’ll enjoy her writing and stories, but this book also makes for a great reference if you’re training effective communication and leadership skills. And, while I first picked it up for that reason, I found it equally important for personal communication skills. Bravo, Judith, on your contribution to making us all a bit wiser and helping us to obtain one of the most important skills for improving human relationships. This entry was posted in communication, HR, Leadership Skills and tagged anger, being right, betrayal, brain, communication skill, conflict, conflict avoidance, Conversational Intelligence, distrust, distrustful leaders, emotions, fear, feelings, human relationships, judith e. glaser, leadership skills, managing conflict, reaction, reframing, righteousness, slights, threats, trust, workplace survival. Bookmark the permalink.